Whenever an app or game becomes popularized, scammers with ulterior motives usually seek to exploit the situation by using them as a way to push their sinister utilities. Flappy Bird, which has been dominating the headlines of late, would seem a prime mode of distributing malicious software, and unfortunately for users of Google’s Android, that’s exactly what is happening right now. Developer Dong Nguyen took the surprising move to pull Flappy Bird from the App Store and Google Play Store over the weekend, even though the title was being downloaded by tens of thousands of folks every single day. He felt that the game was becoming too “addictive,” serving to frustrate rather than entertain, but while Nguyen may have emerged with his integrity intact, the disappearance of Flappy Bird has given scammers a bit of a free pass to begin creating fake versions. 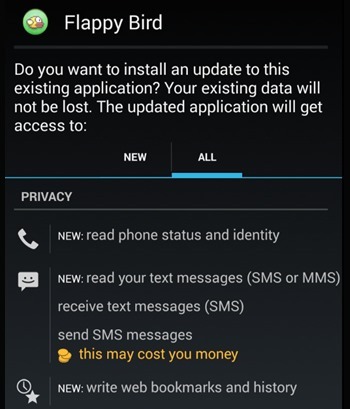 As discovered by security firm Sophos, one particular fake version of the game, which operates under the guise of being a “trial version,” throws in the old premium message scam, with quite some force. Whereas it’s often the case that a user is tricked into sending premium SMS messages and racking up huge bills, this so-called trial goes down the coercive road of insisting that you do; and worse still, won’t close down until you meet the demands. 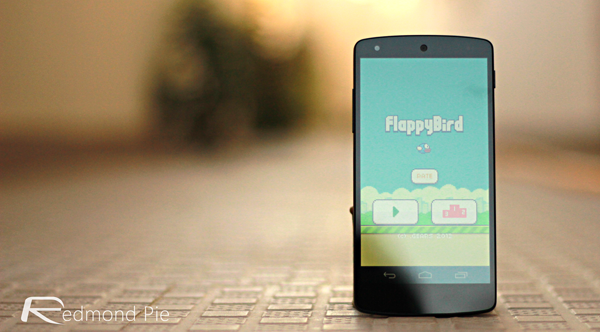 Trend Micro, another renowned security company, has detected scores of fake Flappy Bird apps, many of which you probably wouldn’t even guess were not the real deal. Only, not content with helping you raise your blood pressure by playing the game itself, these largely Vietnam and Russia-based fakes will secretly connect to a Command and Control, receiving instructions that can be used to send premium SMS messages covertly, log carrier and phone number details, and push other information that you wouldn’t readily wish to share with anyone, less such unscrupulous individuals. As ever, if you want to avoid these scams, which are growing in numbers after the recent events with Flappy Bird, then please do stick with the Google Play Store, which will greatly minimize your potential exposure to dodgy apps and games. These hackers are diligent, dedicated and smart, and capable of squeezing information and money from victims in a matter of seconds, so proceed with utmost caution and avoid any unauthorized app download hubs.